Enjoy a comfortable stay at our pet-friendly hotel, conveniently located off Interstate 55 just east of historic Route 66. 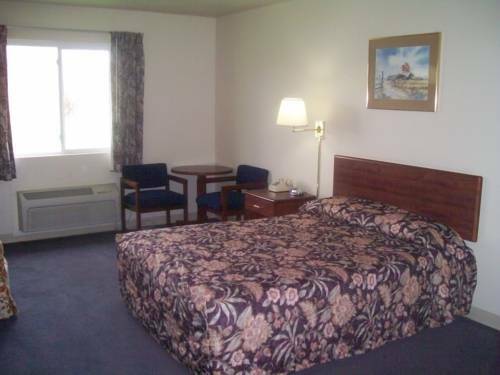 Amenities include free WiFi, free continental breakfast, free parking and copy and fax services. Guest rooms feature microwaves, flat-screen TVs, work desks and interior corridors. Our hotel in Atlanta, IL is less than 30 minutes from the Illinois Regional Airport in Bloomington and less than 45 minutes from the Abraham Lincoln Capital Airport in Springfield. We are also close to the town center and attractions like the Paul Bunyan Statue, Route 66 Arcade Museum, Route 66 Memories Museum and the Atlanta Museum. Whether you are visiting the area or just passing through, the Rodeway Inn hotel in Atlanta, IL helps you travel on a budget. Plus, you can earn rewards, including free nights and gift cards, with our Choice Privileges Rewards program. Pets allowed 20.00 USD per pet, per night. Max 2 pets per room.